Well known Deaf and Dumb Swimmer of Swimmers Club Belgaum and Aquarius Swim Club Belgaum is selected in the Indian contingent to represent India for the 8th Asia Pacific Deaf Games to be held between 3rd to 11th October 2015 at Taiwan. Master Umesh Khade is going to participate in 50, 100 and 200 mtrs. Breast Stroke events. A total number of 25 athletes consist of Swimming, Basket Ball and Badminton will fly to Taiwan from Indira Gandhi International Airport, New Delhi on 1st October 2015. 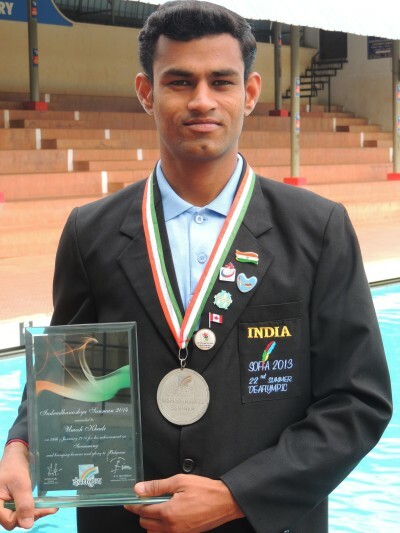 Master Umesh has represented India for twice and has won so far 24 National Medals comprising of 10 Gold Medals, 4 Silver Medals and 10 Bronze Medals at the National Swimming Championship for the Deaf and Dumb held at different places. He is a National record holder in the all the 50, 100 and 200 Breast Stroke event from past three years. He joined swimming in the year 2004 in a swimming coaching camp conducted for the Differently Abled organised by Swimmers Club Belgaum and Aquarius Swim Club Belgaum through Ajay Deaf and Dumb School. He is practicing at Suvarna JNMC Olympic Size Swimming Pool and Rotary Corporation Sports Academy’s Swimming Pool. He hails from agriculture family from Ankali ( 2 k.m. from Sankeshwar). A son of Shri Rudrappa and Mahadevi. He also has elder sister Sumitra also Deaf and Dumb and younger brother Shekhar. At present Umesh is working at Rotary Corporation Sports Academy’s Swimming Pool and stays in a small room provided by the them. He takes his food in a mess at Bhagya Nagar Belagavi.